Jerome Bel, Ballet (New York), 2015. Photo by Paula Court, courtesy of Performa. 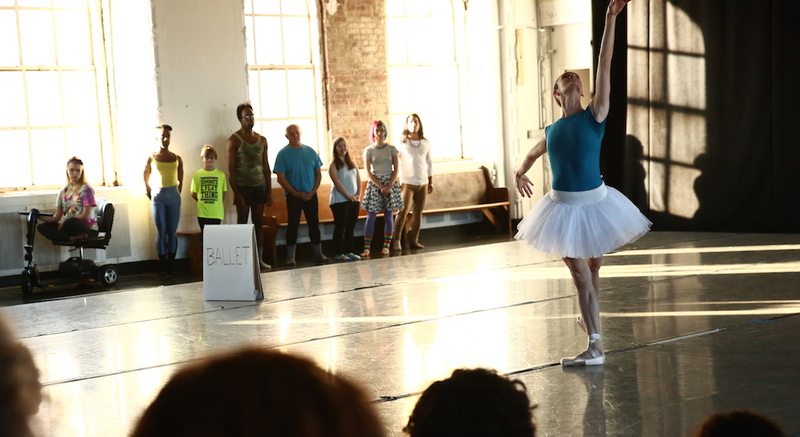 Author Shelton Lindsay (right) in Jerome Bel’s, Ballet (New York), 2015. Photo by Paula Court, courtesy of Performa. The performance unfolded slowly, resulting in a hush at the Marian Goodman gallery, when a female dancer, Moriah Evans, walked out holding a sign that simply read ‘Ballet’. She left the sign stage left, (which later was revealed to be a menu, naming every dance segment) and walked to the center of the gallery. Chopin’s Les Sylphides – Prelude #7 in A, Op. 28/7, swelled, Evans looked into the monolithic photographs of Jeff Wall [hanging in the gallery] —her reflection caught in what represented a hotel door opening and a man entering the frame— and executed a pirouette. She then left center stage and stood with her back pressed against the gallery wall as out walked Hector, a young man, in athletic ware. He too delivered what may be considered a pirouette, but one far removed from the classical language we have come to expect, he was all arms, and static movement, like a statue on a rotating plinth. This was a common theme that unfolded as one by one the dancers entered the gallery, assumed center stage and performed a pirouette as channeled through their bodies. No two expressions were the same, or similar even and this was intentional on Bel’s part. There was a wide rage of diversity on ‘stage’; performers ranged in age from 10-70, there was a varied racial and national composition, and the performers identify as everything from straight through to Radical Faerie. Several of the dancers also self-defined as ‘differently abled’. Yet perhaps the greatest break from what one would traditional expect at a dance performance, is that the dancers themselves were a mix of professional and non-professional. With Alex Clayton, Meagan LeCrone and Moriah Evans in the cast —all professional dancers— each segment did included a technically proficient execution of a particular movement. Across the board the non-professional dancers moved in a way that was unexpected, yet infinitely relatable. It was unnerving, for it pulled me far away from the transcendence and perceived formlessness of a good dance piece and made one examine their relationship to dance. These were all common thoughts that seemed to have dominated the experience of this performance. Unlike many dances, Ballet (New York) was never about escapism, it was about confronting the realities of our own bodies and their limitations. After each of the [single] dancers exited the gallery they reemerged as couples, and danced across the gallery space in what the menu called the “Waltzing” section. The waltz was at times hard to watch. The pairing of bodies created moments of self-consciousness and awkwardness, yet these fumbling interactions strangely felt like the human heart of this piece. Watching the dancers negotiate and discover how to waltz together was beautiful. After this section, they re-emerged as a collective for a 5 minute improvisation in silence. In the menu-declared Improv section Jérȏme Bel curated the unexpected, molding choreography to chaos. This section spoke to how we all have our own languages of movement, and how context is what defines them as dance. Movements, expressions, and bodies that may be overlooked on traditional stages, were given a place to be appreciated and explored as artistic. Each dancer expressed a truth, their own truth. It was illuminating to watch the others move when given the freedom to explore the confines and dimensions of their own body rather than watching them try to execute specific dance movements. After Improv they once again began dancing across the gallery floor this time one by one, to Michael Jackson’s Billy Jean. Each dancer attempted to do the Moonwalk and the sudden audio of pop music was a nice change of pace. After the Michael Jackson segment, Ballet (New York) ended with each dancer taking center stage one last time to bow. As one would expect, each bow was different and spoke to how the dancer sees and is embodied within the world. From start to finish Ballet (New York) lasted 35 minutes and was a thought-provoking meditation on what defines dance, and what we as a culture expect to discover. 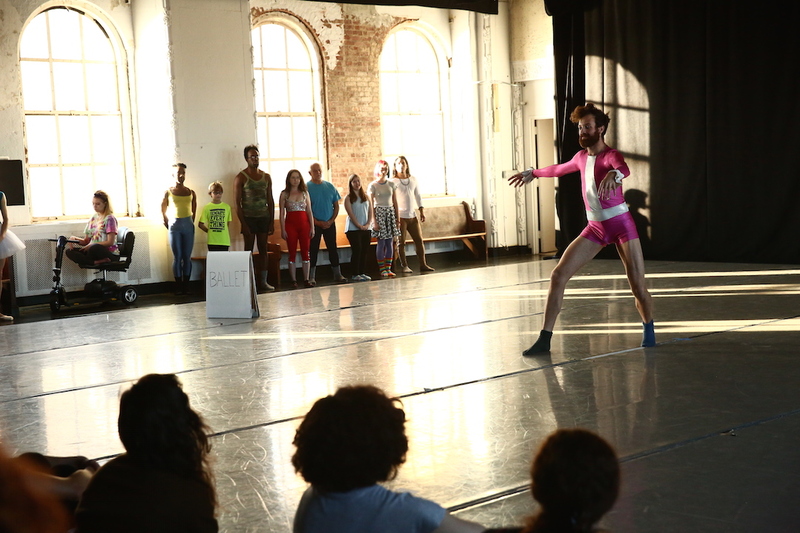 Jérȏme Bel’s Ballet (New York) , was organized by Associate Curator at Performa, Charles Aubin, “Ballet (New York)” as part of Performa 15 which ran from November 1st – November 22nd, 2015 in various locations throughout Manhattan and Brooklyn. Thanks to Shelton for sharing his thoughts with ETTD. More on Performa 15, including a conversation between Katy Diamond Hamer and Jesper Just, coming soon!